My best winter news: I won best in Wildlife in Friends of the Gorge annual photo contest for the above photo! It was the first time I entered and I also took away an honorable mention for my adorable Pika!! AND an honorable mention for my smoky sunset! 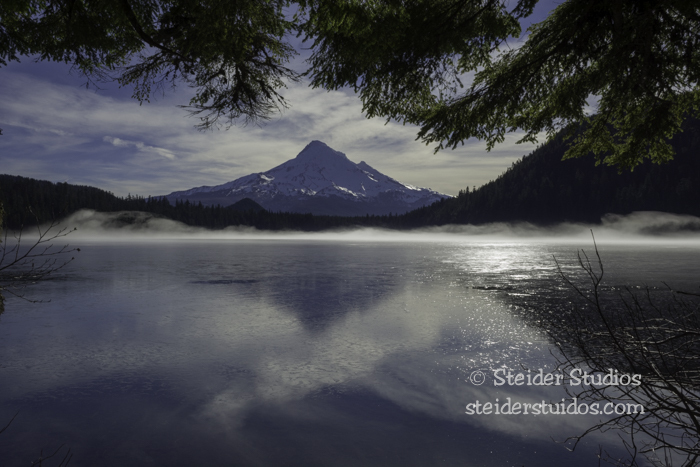 My prize for ‘First’ in Wildlife was a gift certificate to Pro Photo and a fabulous new Columbia backpack! After that first sunny day of winter, we had a bit of snow. I stayed close to home & watched Chickadees in my garden. 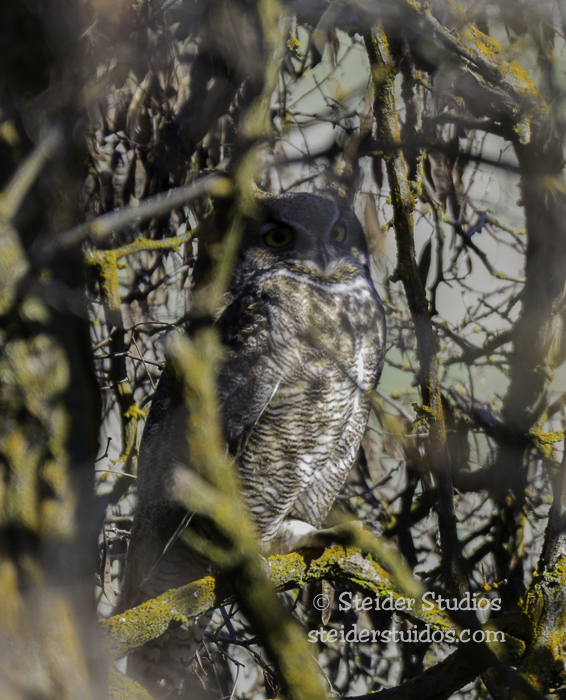 New Year’s Eve I went with a couple of young birders to High Prairie where they showed me a Great Horned Owl. The younger birder has a great eye and spotted a Rough-legged Hawk in the distance and we were thrilled at how close it flew to us while hunting. Alas my fellow birders couldn’t stay long, but I wasn’t ready to leave. Lucky me I watched a Northern Harrier with lunch! My winter raptor survey is in full swing and I loved finding this pair of Bald Eagles near sunset. A few days later I drove along the Columbia just because the sun came out! Saw eagles chasing eagles…. A beautiful Great Blue Heron flew past. And I passed a gorgeous Kestrel sunning at the top of a snag. Back at the Bingen Marina I checked on our Tundra Swans. Yep, still there. They arrive and depart about the same time as migrating Bald Eagles. I believe this is a Horned Grebe soaking up the sun, but I always mix it up with an Eared Grebe. I took a couple of friends from Portland out hunting for Bald Eagles here in the Gorge and lucky us, we found some. We watched a few juvenile eagles with an adult bathing in the Columbia, hiked into Balfour Park, then headed further east. 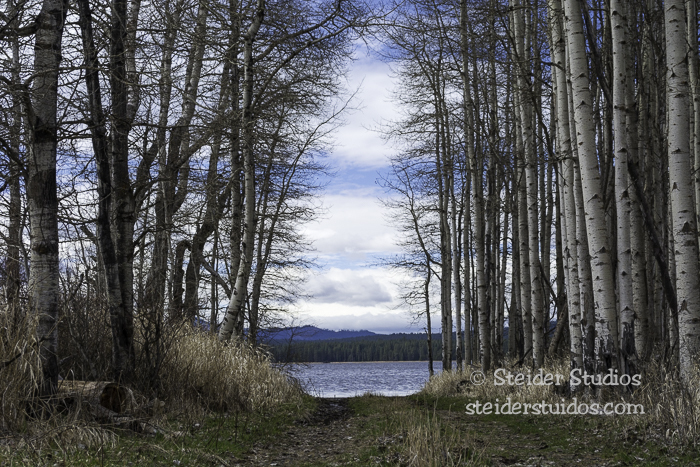 We found this beauty near The Dalles Dam where I was heading the very next week for Eagle Festival. 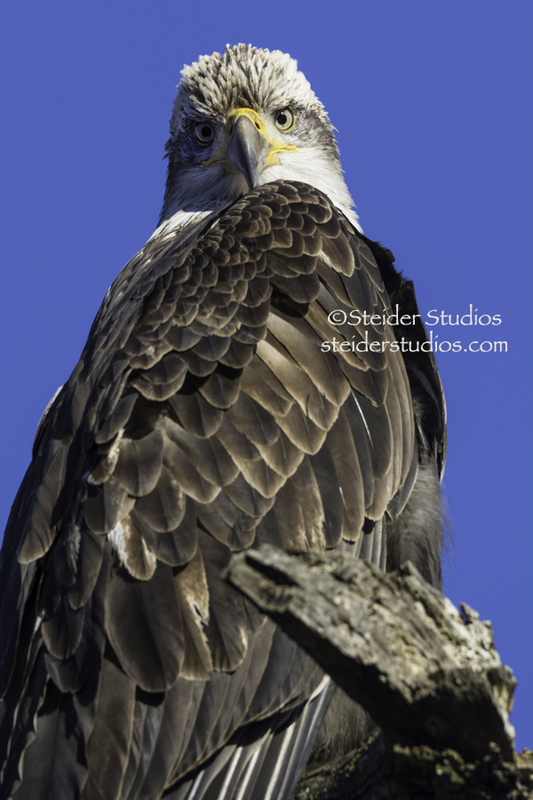 Eagle Festival at The Dalles Dam occurs every January when the Bald Eagle population is at its fullest. I arrived super early hoping for a sunrise shot, but alas it was a gray morning. However, because of my early arrival I had a pretty nice spot for watching eagles fish. I ran into many of my birding friends there, especially after the sun came out! California sea lions also came to the party at The Dalles Dam! It was truly a glorious day. I like taking long scenic drives to see what I can find. This abandoned house had a young bald eagle perched at the top of a craggy old tree next to it. The Klickitat River runs through many little towns in our area. You can get down right next to it or view it from a great height. This time of year it might be snowing or the clouds below so thick that the river is hidden. You can almost always find a Bald Eagle near the Klickitat River. We put in a trail cam and now know what eats our bird seed every night! Oh, and my really big winter news is I’m going to NORWAY where my paternal ancestors came from!! I didn’t know I wanted to go until invited by a loved one. I’m working overtime selling my remaining art glass to fund this surprise trip. More about that in an upcoming post! Since my last art show I’ve been out in the field enjoying wild critters and places with no looming deadlines or responsibilities. I gave a talk on Wildlife Photography to the Sherman County Camera Club, and played at the John Day Dam prior to their meeting. …and I’m back at work in a new & different way! Invited to join and show my photography at co-op gallery, Made in the Gorge… I said YES! 108 Oak Street, downtown Hood River ~ you’ll find me there on Saturdays. Come in & say hi!! I know I keep promising to tell you of recent adventures….it’s just so hard to sit at my computer & tell you about the last one when I want to be out experiencing the next one! My first sighting of a Red-necked Grebe in the Gorge! Our first snowfall of the season on the White Salmon River at Husum. …and my photo used in Cornell Lab of Ornithology’s Macaulay Library!! I so wish it had been a blue sky day instead of winter gray! Thrilled just the same!! I tend to share more often on my Facebook page and would love you to give me a ‘like’ over there!! For now, I’m on my way to shovel off our decks…again! Eight fresh inches on top of two earlier feet of snow this week! Fa La La La La and Happy Holidays to you & yours!! 200 SW Edgecliff, at my friend Ann Fleming’s studio. I’ll still play with art but just for myself, just for fun, and when I’m in the mood…probably only on rainy days. I’ll still be out in the field trying to capture wildlife with my camera, and will print on demand instead of speculation. Most of my images will always be available for you to order on paper, canvas or metal in most standard sizes. This weekend, October 21 – 23; Friday – Sunday from 11am until 5pm. Come say hello, support our local artists! I have so many adventures to tell you about but time keeps slipping away! I must stay home this week to prepare for Art in the Gorge. 18 artists showing our work downtown Hood River at 301 Oak (Third and Oak) in a Pop-Up art show on July 1, 2, and 3! Open hours 11 am until 7 pm Friday & Saturday; 11 am until 5 pm Sunday. First Friday in Hood River will be Fabulous!! Arrive early for easy parking. …and this year’s crop of Eaglets! I’ll have all-occasion greeting cards and prints on paper, metal and canvas. My art glass earrings, bracelets and a few other small items will also be available. If you’re interested in my larger work I plan to re-stock my on-line boutique soon. Most images that I share here can be printed in any size. You can always contact me for an appointment if you’re in the area. Come see me and my fellow artists July 1, 2, and 3 downtown Hood River at 301 Oak. 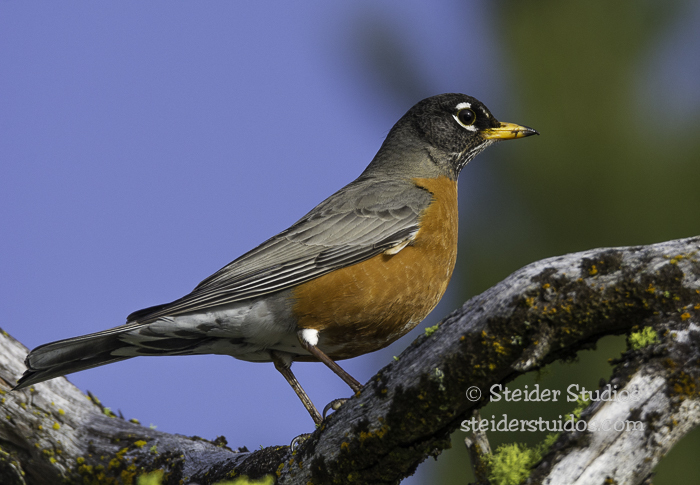 Two weeks from tonight ‘Fine Feathered Friends’ opens at Columbia Arts in Hood River, Oregon. The artists reception is from 6 until 9pm on First Friday, March 6th. Hope you’ll join us to see the work of 15 artists inspired by our theme ‘Fine Feathered Friends’. 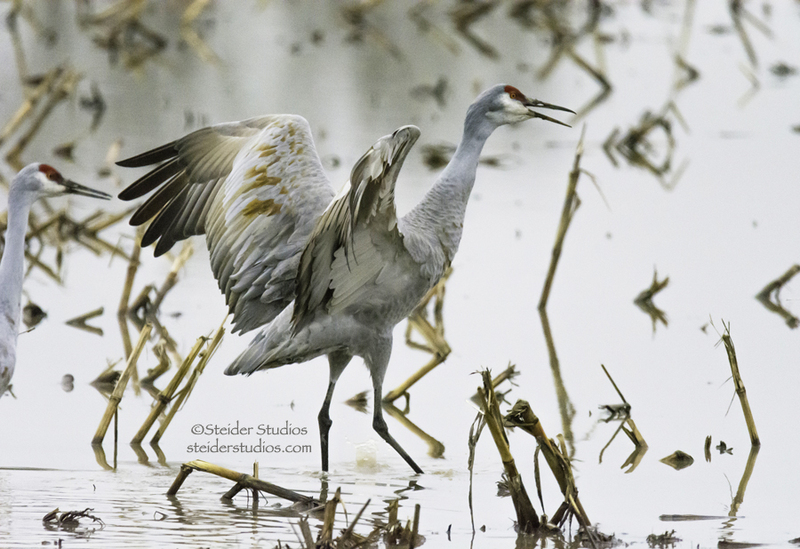 My favorite bird shots will be on display and for sale at the show. My other favorites (because I have too many) are available to purchase as soon as I get them listed in my shop! Or if you can’t wait, you can always let me know what you like and I’ll order it for you!! Until then I’m entertaining & inspiring myself by getting outdoors. I love nature and the Columbia River Gorge has been ever so beautiful lately. Here are a few of my favorites from this last week or so. 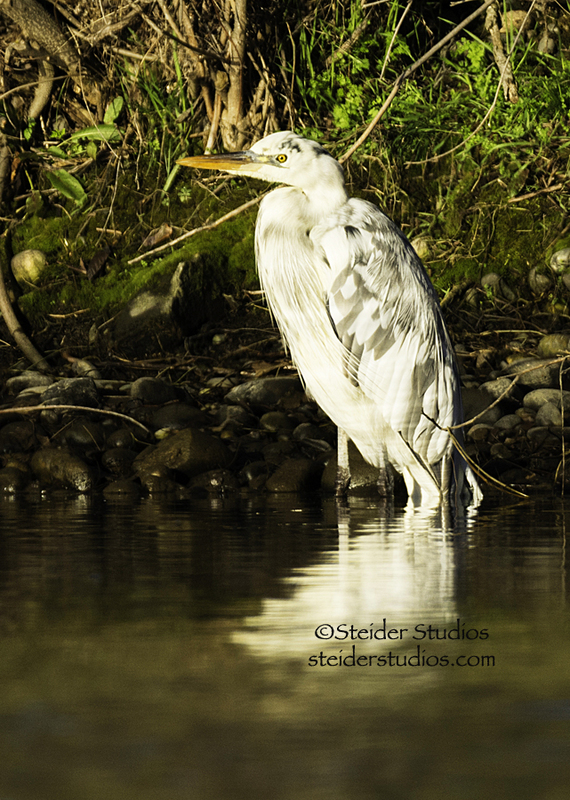 Went back to find the leucistic Great Blue Heron just after sunrise. Saw my first Hummingbird of the year at Bingen Marina! Also watched a little Swan action at Bingen Marina. Finally got a good shot of a Night Heron at Hood River Marina. Parked under this Red-tailed Hawk in Glenwood. Gazed at Conboy Lake on the refuge for a while on a beautiful blue-sky day. Followed a herd of Robins at Conboy National Wildlife Refuge. Yep, it was a herd. 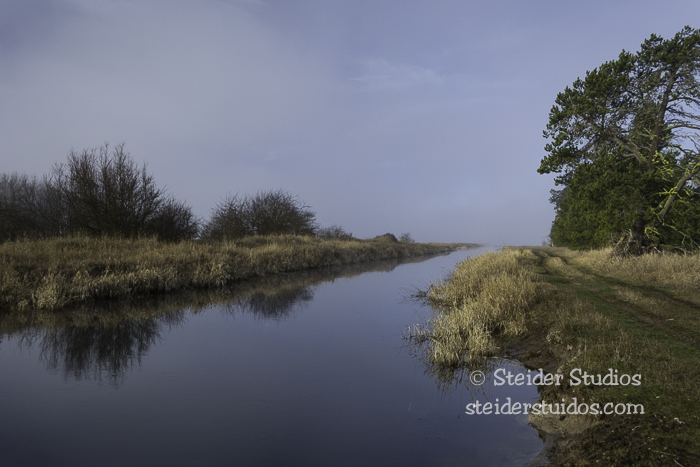 More Conboy Lake National Wildlife Refuge gazing on a misty morning. 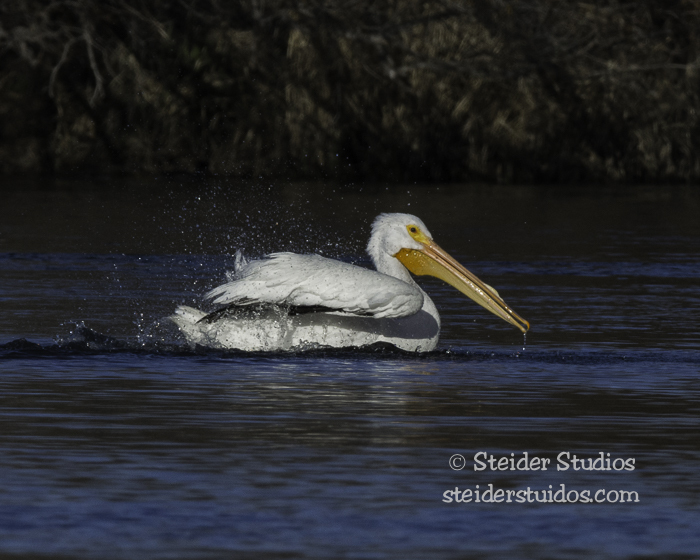 Watched an American White Pelican bathing in the Deschutes River. And more…..but that’s enough for now. Don’t forget, come to my opening, First Friday at Columbia Arts in Hood River!! January has been crazy busy driving up and down the Columbia River chasing Eagles and Herons with an occasional foray to Conboy and Ridgefield National Wildlife Refuges. Today I drove above the cloud/haze/inversion to grab some vitamin D in the form of SUNSHINE at Lost Lake! 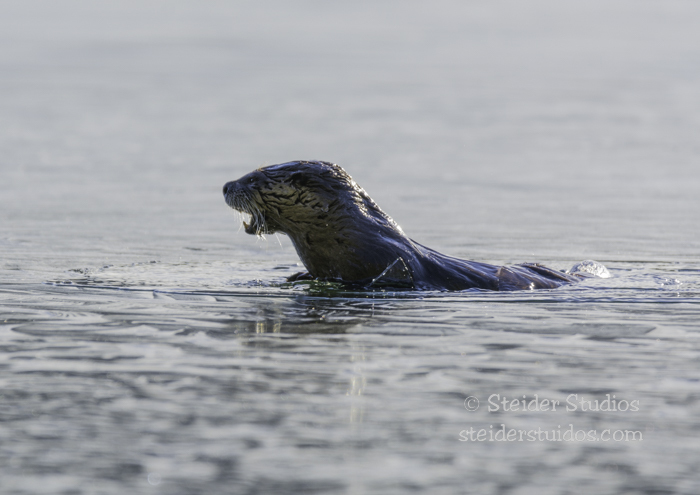 What a special surprise to capture this lone Otter fishing. 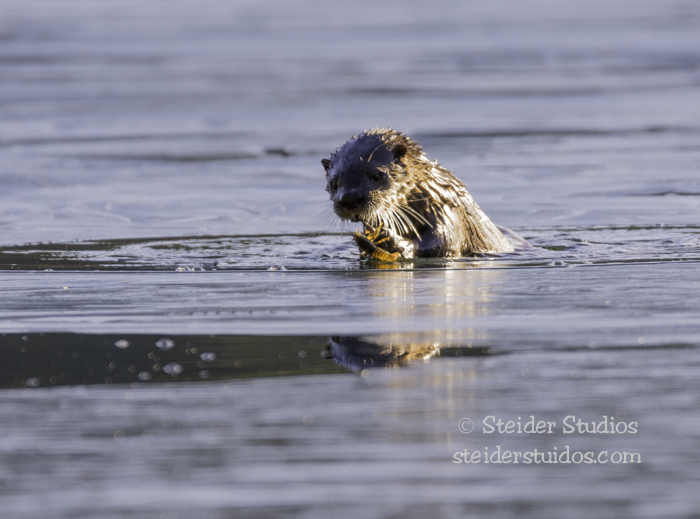 The lake had a layer of ice, so the Otter had to break through the ice to surface with his prize. In this photo, you can see chunks of ice near his ‘elbow’ as he munches on his catch. 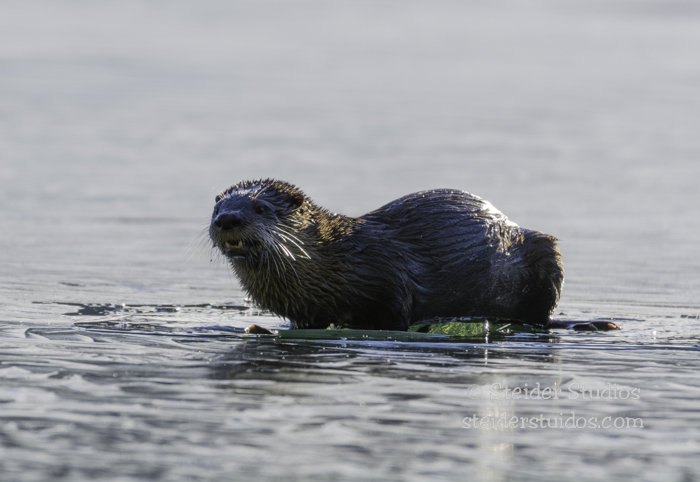 With each ‘catch’, he climbed onto the ice and ate, then dove back for more. Is this a crawfish he’s eating? It was so quiet on the lake, he didn’t notice us until we went crashing through the brush, trying to keep up with him as he swam away. I’m making a big effort to really learn my camera better and use it to its fullest potential. 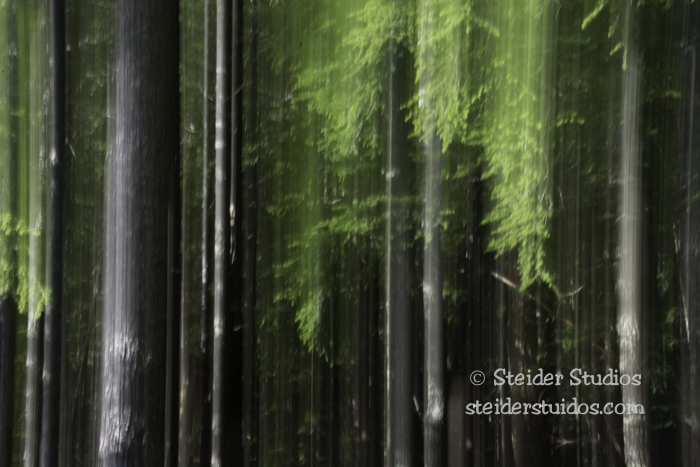 In that light, I had a little fun with some experimental ‘blurred motion’ shots of the gorgeous surrounding forest before we left. The pictures I haven’t shown you between my last post and this one (because I’ve run from one adventure to the next with no stops between) are on my Facebook Page, ‘Steider Studios’. I try to post a daily photo of what I am lucky to see here in the Gorge, or regionally on the occasions when I leave my mountain top. Many more fun events are coming up. Sunday, Feb 1st is the group ‘bird walk’. We may go to the Maryhill or Columbia Hills area – let me know if you want to join us & I’ll let you know where & when to meet. 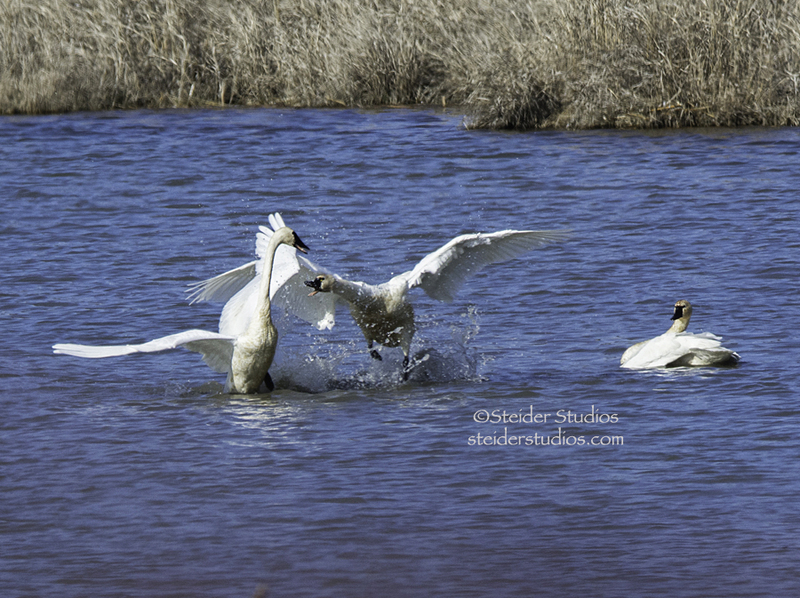 Feb 12 – 15 I’ll be in Klamath Falls for Winter Wings Festival, photographing everything I see while I’m there! 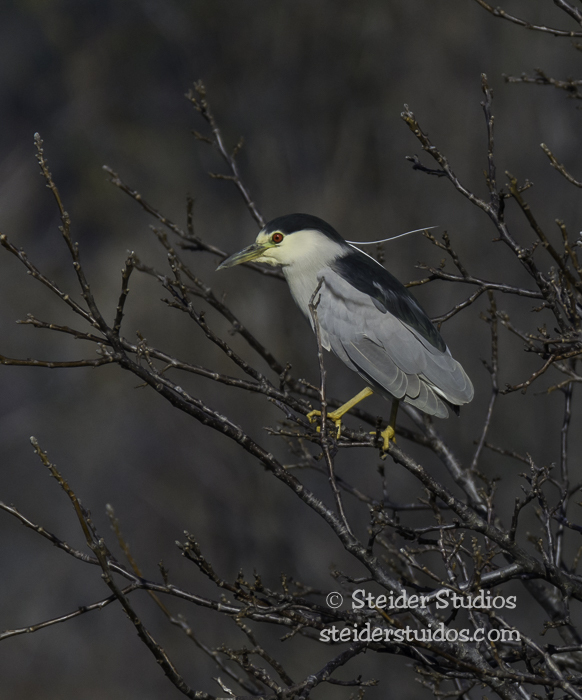 Sunday, March 1st is another group bird walk. 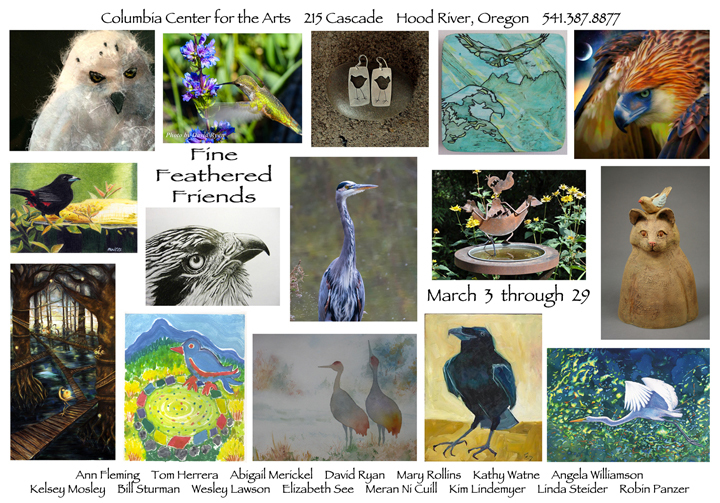 First Friday, March 6th my show, “Fine Feathered Friends” opens at Columbia Arts and runs through March 30th. Co-curator Robin Panzer and I have put together a fabulous month of events for your enjoyment in addition to 16 artists presenting their artwork! Many of our artists will demonstrate their process during the month and we’ll have an interactive display on loan from Conboy National Wildlife Refuge. On Mar 7th come see Raptors, live in the theater at Columbia Arts! Mar 14 you can paint a birdhouse in the studio. Mar 21st, enjoy a fashion show of feathery tattoos and a tattoo demonstration. 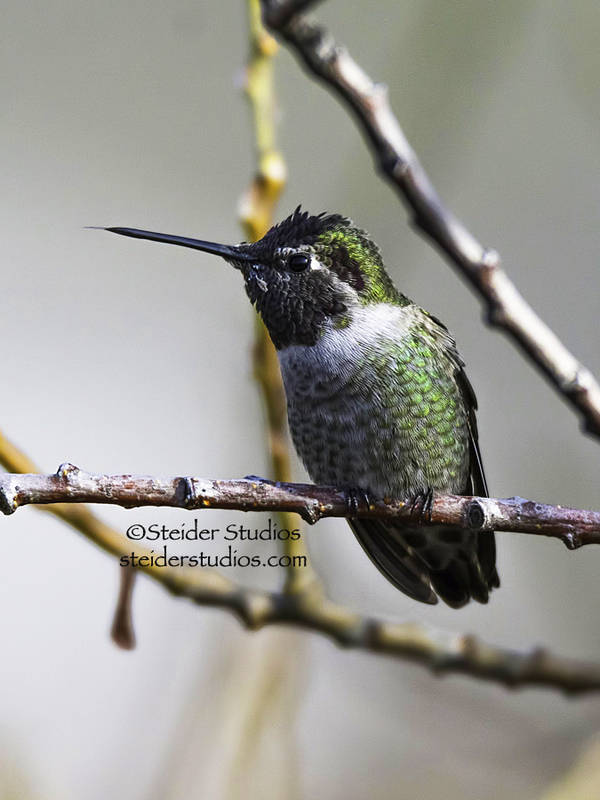 Mar 28 join us for a short hike up the Hood River stairs into an older neighborhood to see and learn about our resident birds with field biologist, Cathy Flick. I keep thinking I’ll have plenty of time to tell you everything, but when the sun is out or eagles are flying, or an opportunity for fun presents itself….I’m going out to play! Maybe I’ll see you out there! !